Posted May 28th, 2015 at 2:31 pm. As a 16-year-old living with her family in Kampala, Uganda, Rebekah Adams’15 saw firsthand how ethnic affiliations can be manipulated to maintain and stoke social divisions. The family lived near the Kasubi Tombs, the burial ground of the four kings of Buganda and a UNESCO World Heritage Site, which was engulfed in flames one night in a still unexplained fire. By morning, fingers started to point in blame. The Baganda, a Bantu ethnic group native to the region, regarded the central government and other ethnic groups with suspicion. When the president visited the aftermath of the fire, riots erupted. 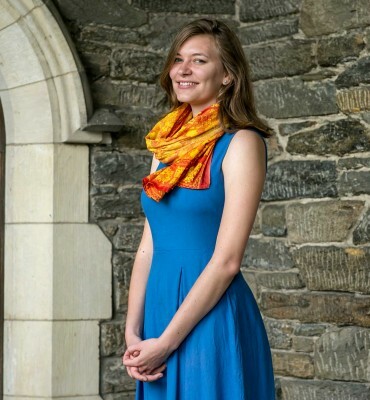 While at Bryn Mawr, Rebekah won the Foreign Language and Area Studies (FLAS) Fellowship from the University of Pennsylvania to study intermediate Swahili and enrolled in several African Studies courses. The courses also gave her a better understanding of the region she’d called home for so many years. A sociology major, Rebekah declared an Africana Studies minor (eventually taking more courses in that field than in her major); spent a semester in South Africa at the University of Cape Town; and earned a fellowship, fully funded by the Teresita Sparre Currie ’43 Memorial Scholarship, to Dalun, Ghana, where she engaged in community development work at a local radio station and computer center. After her Boren year, Rebekah plans to assist a professor at the University of Cape Town (South Africa) with a research project on food security in sub-Saharan Africa as a Commonwealth Africa Scholar.